The Ministry of Public Health has released to the Government Information Agency (GINA), the causes of death of two babies in Lethem. 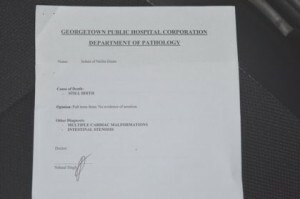 Minister within the Ministry of Public Health, Dr. Karen Cummings and a team of pathologists had visited the region to meet with the mothers and to carry out pathology examinations of the stillbirths following an initial investigation by the Regional Health Services Department. The first examination done on the baby delivered by Sabrina Teloki shows that there were a number of complications surrounding the death. The mother of the baby had been having high blood pressure levels which are believed to have caused the death of the baby. According to the opinion of the Pathologist, there was no evidence of the baby breathing during the period of labour. The second mother, Nelita Greene found out that her baby had a heart deformation resulting in the baby not surviving the final stage of pregnancy. Greene had defaulted from treatment during the course of her pregnancy. 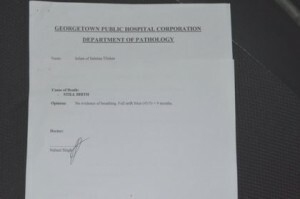 The Pathologist’s report states that the cause of death had been diagnosed as Multiple Cardiac Malformations and Intestinal Stenosis. Minister Cummings, during her visit to Lethem had expressed condolence to the mothers, and suggested counselling for them.